Oatmeal (avena Sativa) (organic) is naturally beneficial for the skin. It can provide soothing relief from sunburn, poison ivy or other irritations. Many good cosmetic products contain oatmeal for its benefits to the skin. 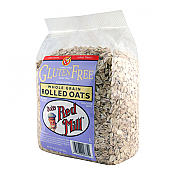 We love Bob's Red Mill gluten free oats! 1. Dryness fighting: Oats contain polysaccharides, which become gelatinous in water and leave a fine protective film on the skin, preventing dull, flaky dryness. 3. Defense building: The proteins in oatmeal help maintain the skin's natural barrier function, which ensures that the world outside the skin stays out, and what's inside the skin stays in. 4. Pore cleansing: Oats are filled with natural cleansers (called saponins) that gently remove dirt and oil from the pores, making it wonderful in soaps and scrubs.